Crossposted and originally mentioned by gothick_matt on Twitter, the BNP rather unwisely tried to do a parody of a Marmite advert as a party political broadcast. Unfortunately for them Unilever have rather better lawyers and they’ve just agreed to pay somewhere between £70K – £170K for copyright infringement. Because of the BNP’s parlous finances it means the party is likely to go bust. Oopsie. I’m doing another one on Sunday. Because I’ve been doing BJJ and grappling for a while I entered the first at intermediate level and I’ll be doing the next one at advanced level. Now I’ve got a bit of experience I find I like the competitive nature of trying to get your opponent to submit before you do. Also coming up is the Leeds Hacks & Hackers day. For preparation I’ve been playing about with some location data from the Ordnance Survey including coordinates for streets and postcodes. These have to be in separate tables as the main source for having them combined is the Postcode Access File available from the Post Office and which costs money. What I do have now is something that uses geolocation (usually a mobile phone GPS but Wifi with Google Gears works as well) to display a small Google map with your location along with the top 5 nearest streets and postcodes and links to find the nearest bus stop on the Metro next bus service. I’ve got postcodes for the BD, HD, HX, LS, M, OL, S, and WF areas, and SYPTE and Metro use the same service so it should be pretty easy to do one for them. GMPTE uses a different system that needs further investigation. I do have other postcodes as well but they need a bit of processing before they’re usable. I’ve done this in C#, ASP.Net and SQL Server but it should be pretty straightforward to do it in PHP and MySQL for something that works on most Linux hosting services. Some of the other people signed up to the hack day should be familiar about these parts, including myfirstkitchen, John Eland from Exposure Leeds and Neil Owen from Test Space. Apart from the web content manager from Leeds City Council it looks like I’m the most “corporate” person there but I daresay I’m probably not the most conventional person around. Should be a good day for networking and doing things with people that doesn’t involve punching or strangling them, and I wouldn’t be at all surprised if we decamp off to the pub afterwards. Right, so, had a fight just over a month ago. I keep meaning to write about it, after all even though I don’t blog anywhere as much as I used to, it’s still quite a major thing to do. In the back room I got changed and had to tell people to stop prodding my facing and speculating what it might be. Downright irritating and for obvious reasons I wanted to get it checked out properly. I was back training on the Wednesday but I took it easy for a few days. 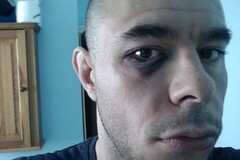 I found out later that my opponent broke his toes during the fight and had to miss training for a few weeks. 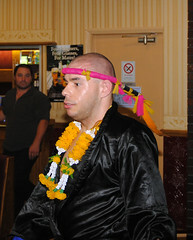 Full contact Thai boxing is definitely a tough sport and I’d say tougher than Western style boxing. I know a few people found it difficult to cope with me doing it, not just because I ended up in hospital but I think also because I could have put someone there. In this kind of thing both fighters are usually reasonably evenly matched and I can understand why people might be uneasy with the idea of me as a fighter at this kind of level. Would I do it again? Yes. However what I’ve got in mind for my next fight is something completely different and going for the BJJ no gi British Opens at the end of September. After I got my blue belt at the end of April I decided that I may as well do something with it. This will be submission grappling, so I’ll be throwing people around, bending their limbs the wrong way and trying to strangle them. No punching or kicking though. I’d like to do it for the experience even if I get submitted within the first few seconds. Someone dropped out of a fight on this show last Wednesday so I asked if I could take it over. My instructor and the show promoter agreed and last Thursday I got it confirmed that I would be fighting with just over a week’s notice. A week’s intense training later and I fight in two day’s time. This will be tougher than the fight I had in Leigh last year: it’s over 3 x 2 minute rounds, full C class Thai rules (punches, kicks, knees and full clinching allowed, but no elbows or knees to the head), and the only protection I’ll have will be shin pads (as well as obviously a box and gum shield). No head protection and no chest pad. 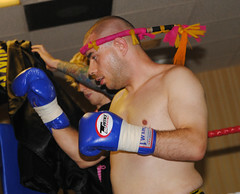 For comparison, an amateur or white collar boxing match is either 3 x 3 or 4 x 2 minute rounds and with head protection. All I know about my opponent is which gym he’s from, that he’s 85 kg and has one fight with one win. I’m a bit heavier because of the short notice but they do give you a bit of leeway at this level. I’m not going to go into all the preparations I’ve been doing, but I do think there’s a serious chance I could win on Saturday. Some people only train when they know they’ve got a fight coming up, but because I train pretty much all the time it meant I was in a position to be put forward at short notice. I didn’t put my name down for this show at first because I thought I might be busy that weekend, but that’s now been postponed to September. Finished my last training session last night and now I’ve got 2 days to rest and complete the final preparations before Saturday. This will be a home town fight so there’ll be lots of people I know there to watch, both from my own gym and from other local ones. I’m also taking tomorrow off work so I don’t have to think about that. Because of the nature of my day job I’ve decided my fight nickname will be The Administrator. I daresay you don’t get many Thai boxers with 9 years professional software development experience and I wanted something suitably techy but also dominating. With my last fight over a year ago this one has been a long time coming and I’m looking forward to it. Fast and furious for a debut fight. The fight itself begins about 5 minutes in. 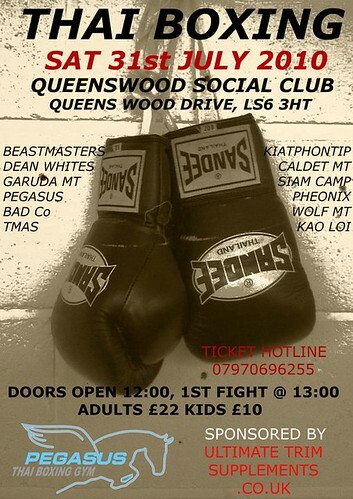 Incidentally, it’s looking very likely that my debut MMA fight will be on the 6th of March next year. And now my fight’s off again after my opponent pulled out. Oh well. I can eat again now anyway. Hopefully it’s been noticed that I’m prepared to drop everything at a minute’s notice if this type of thing does come up. 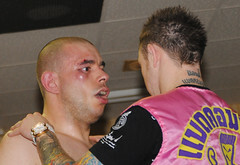 Just waiting to get the final confirmations through, but now it looks like I am fighting on Sunday after all. Amateur Thai rules with shin pads and probably over 5 rounds of 1.5 minutes. I’ll be a bit overweight for this because I only found about it this afternoon, but this is only my first full contact Thai boxing match so it’s not as critical as if it was at a higher level and my opponent might be a bit over as well. Wish me luck. I mentioned over on Twitter what I had planned for my entrance music and was pleasantly surprised to get a reply back from the band wishing me good luck. On the subject of Twitter, I was quite amused about today’s shenanigans about Carter Ruck (sic) and Trafigura. My own contribution was a few hash tags: #Trafigura #CarterRuck #StreisandEffect #snigger. I’ve been reading about these injunctions in Private Eye and hopefully what happened today will mean people ask questions about them, and judges will think a bit more carefully about granting them. Never was there a better example of the Streisand Effect, apart from the original one where an obscure project into Californian coastal erosion suddenly had hundreds of thousands of visitors after Barbra tried to get them to stop it because they took a photo of her house. Early days yet, but I may be fighting again fairly soon. My Thai boxing instructor emailed me to tell me he’s put me forward for a show that’s probably in Harrogate and probably in September. The person running this show (Pierre Mahon, for people reading this via the Facebook feed) has pretty close links to my gym and I’ve known him since a couple of months after I started training in 2005 when there was a lot more of me. More details as and when I get them, but this will be amateur Thai rules, a step up from my last fight, still with head guard and shin pads but judged on effect rather than points for kicks and punches. 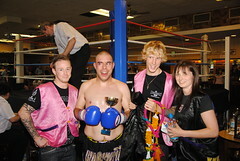 It took 4 years training to get my first fight and now it looks like I might be having 3 in the space of 6 months. Result, I think is the appropriate phrase. One fight out of the way and I suppose I should really make a start on thinking about the next one. Way back in 2005 when I started doing Thai boxing I always intended to fight but I knew it would take a long time to get to the level where I would be able to. When I watched my fight with my instructor on Wednesday he said it was a good effort for a first fight and that my next one should be amateur Thai rules with full contact, which means sweeps, leg catches and full clinching will be allowed. I’m quite a strong grappler so it’ll be good being able to do it properly. Amateur rules mean I’ll be wearing head and shin pads, but no chest pad. Full contact means there will be a chance of knock outs and cracked bones, but I knew what I was getting into. I’ve put my name down to fight again and suggested probably September would be a good time for my next one when I’ll have a better idea of what’s going on at work. Training to fight is hard work and it was quite handy that I was a redeployee in May so I didn’t actually have much to do. I also want to do our end of year show in December. I originally wanted to do it at the end of 2007 but things didn’t quite work out. Last year’s bike accident put the kibosh on me fighting for a whole and overall set me back about 3 – 6 months but now I’m a lot fitter and stronger than I was even 6 months ago. I’m planning on fighting at cruiserweight which for Thai boxing is in the range 80 – 86 kg and which my instructor agrees is the right weight class for me, so I’ll need to lose a couple more kilos, but the days of needing to lose weight for my health are long gone. Taking a look at people in their late 20s/early 30s who do the same kind of job as me suggests that now is the time to take action to avoid the worst excesses of middle-aged spread. I think it’s safe to say that the habits you have in your 30s and when your career is kind of settled tend to stay with you. After what I’ve done over the last few years I really don’t want to go back to how things were. Last weekend I bought a new suit and was debating whether to get the trousers in a 34″ or 36″. Had to get a 42″ jacket because a 40″ was too tight around the chest and shoulders. In the past it would have been 48″ for both trousers and jacket.